Josh Corman: I’ve read where you talked about the different nature of this album. 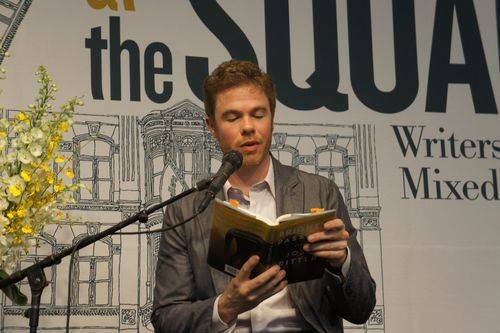 You’ve had a lot of story driven, narrative driven work in the past, on Animal Years and on The Historical Conquests of Josh Ritter through So Runs the World Away. Does it feel strange now that you’re performing these new songs from something that’s got this deep personal connection, not just to your thoughts, but to your life and what’s happened to you? Does it feel strange to share that with an audience after the process of creating it in isolation? Josh Ritter: Well, I think that the real rubicon to cross was, ‘Am I gonna share this stuff,’ you know? And then I thought ‘ If I don’t share this stuff, I’m just a weenie.’ This is like the moment I was made to write about. If people don’t like this record, that’s one thing, or if they don’t understand it, that’s another thing, but if I don’t write about it, then what else am I doing with my life? So there was no question that I had to write it, to put it out there in the way that I wanted. But once it’s out there, I’ve always felt that onstage, the point of being onstage was to get embarrassed and then move on. That’s just – that’s what you do; I mean, that’s what life is about, anyway. It’s about doing things imperfectly and a making the best of what’s going on and reveling in it sometimes if you have to. You throw everything into something and it doesn’t quite work, or you throw everything in and it works out outstandingly well and you try to do it again and you can’t replicate it. So really, that’s the stuff that’s fun. Baring your heart onstage is, for some reason – it seems much easier when you give yourself totally over to it. If I did it halfway, if these songs were hiding anything, it would probably be harder, because I would know that there was a trap door there, I would know there’s a secret door there and that I was hiding something here and a there’s a skeleton in the closet there, but this is just all stuff that happened, so it’s easier to just kind of level with it for me. JC: You’ve got what seems like a pretty inviting relationship with fans. Onstage, it does seem like there’s this sort of joyful element to the performance and it’s kind of reflected in what you just said about this eagerness to experience that [onstage]. Do you feel like not worrying so much about getting everything exactly right makes it easier to have that relationship with fans happen where you’re not scared of them because you’ve sort of accepted up front the kinds of limitations you were talking about? JR: I think that’s absolutely true. I’m not a musician to be separate from the group. I want to be part of the group; I want to be with everybody. I have one foot very squarely in the people who have come to see something. I want to be a part of that, I like the mish-mash in the room of all these people together. That’s so much fun. It’s not like a violin concerto, where it should be played perfectly. The standards are equally high for the music that I play, but I’m putting the experience first, you know? From a visceral stance rather than a more analytical one. JC: And did you learn anything different about that dynamic between artist and fan with [Bright’s Passage] in comparison to what you had done before with music? It’s a very different experience consuming the one versus consuming the other. JR: That’s a really good question, and that’s something I learned as I was going around with the book. I realized for the first time that the writing of a book is a performance, and your success in writing a book has a great deal to do with how you picture the audience. Because, you know, with a song, you can write a song and then play it for somebody that afternoon and then play it for a crowd of people that night. You can share it. You can’t share it with a novel; you have to perform for yourself as a composite of your audience and trust that that performance is good from day to day as you’re writing. It’s a really different thing, but in the end, you’re still performing. Somebody takes that book home, and you’re performing. Even if you can’t see it and you’ll never get the applause, it’s still there. JC: The first time you put out a record or play a show or play a song for somebody there is, I would imagine, kind of a healthy level of trepidation, that good kind of nervousness. Did you feel, in writing the book, nervous anew? JR: Definitely. I wanted to be nervous. There are only a few things that are really currency in art, and one of them is excitement for the future. Bright’s Passage is the first time I was really nervous about what was going to happen, whether people were going to like it or whether they were gonna tell me to sit down and shut up or ignore it altogether. That’s a really important part about writing: being excited about what’s down the line. JC: You talk about the future. Are you still writing prose regularly? JR: Yeah, it’s something that I’m doing regularly, although right this very moment I’m focused on – most of my energy is on playing shows, but I’m deep in a second book…. People can only handle so much. You yourself can only handle writing so much before you need to take a break. Books and writing, [which is] something that I really need to do can be satisfied if I have this other thing, which is the novel. It’s something that I love and something that I feel like – I feel like I’m at the beginning of my career, I feel like I can get so much better. It’s fun to think about, just to read and be interested by it. I appreciate that my situation is a different one than some people’s. There are people who write and write, and no one will give them the time of day, and I got, because of being a musician and having some notoriety, I had the chance to reach some people with this book and let them, perhaps, see somebody at their very infancy as a novelist. That to me is exciting. I want to do it and I want to be really good at it, not a vanity thing on the side. This is something I feel really excited about. JC: What kind of things have you been reading? Are there things you go to for inspiration, or do you just sort of let whatever you run into serve that purpose? JR: It’s a mix. There’s stuff you can always go back to. I always think anything from Shakespeare, like Macbeth. You can’t fail to have an idea – you know, the rhythm, the characters – these amazing characters that are so beautiful, but then I’m always discovering new stuff. Like, I just discovered Shirley Jackson. I don’t know how I missed her. With The Haunting of Hill House, it’s like, ‘Wow, now I have a whole new author to read.’ That’s going to be fun. The other thing that I like to tell everybody is that all you get as a writer is permission to read whatever you want. Your responsibility is to go wherever your interests take you, and right now haunted houses are it for me. I love it. JC: What about Desert Island Books? JR: Oh yeah. Definitetly. I think Loitering with Intent, by Muriel Spark. Deadwood, by Pete Dexter. JC: Have you read The Sisters Brothers, by Patrick DeWitt? JR: I have it on my nightstand right here. I’m about 17 pages in. JC: I was gonna say, when I was reading Bright’s Passage, that was one of those where I saw some similarities. They work almost as companion pieces in some ways. JR: Yeah, I’m really excited about reading it. So far, it’s hilarious. JC: Definitely some dark humor. I think those are some of the common notes that I picked up on. You talked about reading and how that influences you. You talked about Macbeth. You’ve got Shakespearean references, you’ve got Huck and Jim, you’ve got a lot of literary and historical figures that are populating a lot of your songs. Has that always been a natural source of influence or inspiration for you? JR: Yeah, always. Each character is like a new voice, like singing in a new voice. And if you think about, like, what would Huck Finn do if he was driving in Arizona somewhere, trying to find a radio station? I think that stuff is really cool to picture in a new way. It’s exciting. I love that a good character can take you a long way into songwriting. The Beast in its Tracks and Josh Ritter’s other (excellent) albums are available at his website. Bright’s Passage (Dial Press, 2011) is now out in paperback.